By now, I hope readers have discovered that if this site is read from the first postings onward, it provides a useful course in identifying icons and reading their inscriptions. Being able to read inscriptions is a very important part of the study of icons, and it is not difficult. Today we will look at another icon of Ioann Predtecha — Иоанн Предтеча — John the Forerunner — commonly called John the Baptist in the West. You may remember from previous lessons that the Church Slavic СОБОРЬ — Sobor — means “council,” “assembly” “gathering” and it is even the word used for a cathedral. Here it is appropriate to translate it as “assembly.” In Orthodox Church calendrical usage, a sobor (Greek synaxis) was originally (in Constantinople) an assembly for liturgical purposes at a church, in honor of a saint or saints involved in a particular event (often a day after an event celebrated as one of the major feasts) These calendar celebrations were later generally adopted in Orthodoxy. So we find, for example, the Sobor of John the Forerunner celebrated on January 7th, the day after the Feast of the Bogoyavlenie — the Theophany (the baptism of Jesus). Бы́сть Иоáн­нъ крестя́й въ пусты́ни и проповѣ́дая крещéнiе покая́нiя во от­пущéнiе грѣхóвъ. Buist Ioann krestyay v pustuini i propovyedaya kreshchenie pokayaniya vo otpushchenie gryekhov. We see the people of Jerusalem coming out of their city, on their way to John. и крещáхуся вси́ во Иордáнѣ рѣцѣ́ от­ негó, исповѣ́да­ю­ще грѣхи́ своя́. i kreshchakhusya vsi vo Iordanye ryetsye ot nego, ispovyedaiushche gryekhi svoya. Бѣ́ же Иоáн­нъ оболчéнъ власы́ велблýжди, и пóясъ усмéнъ о чреслѣ́хъ егó…. Bye zhe Ioann obolchen vlasui velbluzhdi, i poyas usmen o chreslyekh ego…. It is interesting to note that among the beasts surrounding John, we find a lion, a donkey, a camel, and even a unicorn. Because the word used to describe John’s desert in the new testament means “wilderness,” (a wild, deserted place) Russian painters — who did not know what the Judean desert was like — just painted a kind of forest instead. That is typical of this type in Russian iconography. It is interesting to note how the landscape is painted. As I have mentioned before, the Old Believers — while keeping the abstraction of “human” figures, nonetheless borrowed techniques for painting landscapes from the more realistic art of Western Europe. The foliage of the trees and bushes consists of progressively lighter leaves superimposed on a darker background, a technique also used in the landscapes of Western Europe.The water is composed of background washes of shades of blue, with horizontal strokes of dark to light superimposed upon it. From all of the characteristics of this icon — including the strong use of bright gold with a bright red inscription upon it, as well as the abstract manner of painting the human figures, combined with the somewhat “westernized” landscape, and the Old Believer blessing sign of “Lord Sabaoth,” we can reasonably assume that this attractive icon is from one of the number of Old Believer icon workshops once found in various cities and towns of the Urals. Today the icons then produced in those Ural workshops are generally known under the blanket term “Nevyansk School” (Невьянская школа — Nevyanskaya shkola ), after the city of Nevyansk (Невьянск), the largest center of the Old Belief in the Urals — though Nevyansk icons were painted in a number of places in the region (such as Nizhniy Tagil/Нижний Тагил, Staraya Utka/Старая Утка, Krasnoufimsk/Красноуфимск). Large numbers of Old Believers from parts of Poland, northern Russia and the Volga settled in the important mining region in the early 18th century, bringing with them influences from various schools of icon painting. The “Nevyansk School” of icon painting that developed out of this was largely active from the second half of the 18th through the first half of the 19th century (though there are earlier examples), and benefited from the patronage of those involved in the rich Ural mines. But with the economic downturn in the Urals and other changes, the school went into a decline in the second half of the 19th century. In the map below, the large black dot in the circle at lower right is the city of Sverdlovsk. Going northward, we see Nevyansk, and some distance above it, Nizhniy Tagil. Krasnoufimsk is at lower left. In earlier postings we have seen how Russians depict John the Baptist, more commonly called “John the Forerunner” in Eastern Orthodoxy. The Second word ΑΓΙΟΣ similarly has an added “h” in old pronunciation, making it HAGIOS. In modern Greek it is pronounced more like A-yos. In both cases it means literally “Holy,” and is the word used for a saint. In Greek the definite article the (ho here) is often used where in English it would be left out; that is why the first “the” above is in brackets). If you know that the Greek word metanoia means “repentance” (more literally “to change one’s mind”), then you will have little difficulty deciding which inscription is depicted in this Greek icon. Metanoeite, engiken gar he basileia ton ouranon. So we see there is nothing unusual about this image. The cross staff he holds in his hand is common in Western European paintings of John, but is not common in Russian depictions. So whether you encounter John the Baptist as Predtecha in Russian icons or Prodromos in Greek icons, it is the same “Forerunner” title, and you should have no trouble recognizing John and, in most cases, in deciphering his scroll inscriptions. As I often repeat, icons are very repetitive, so a little learning goes a long way. One of the first icons I studied when I began research several decades ago was that of John the Baptist, called John the Forerunner (Ioann Predtecha) in icon inscriptions. Icons of John are interesting for a number of reasons, not the least of which is that they tend to mix together related images in a somewhat dream-like fashion. In this Palekh-style pattern for an icon, for example, we see John the Baptist in the type sometimes called “Angel of the Desert,” meaning John is shown winged and standing in the wilderness, which in very old icons consists of a few abstract rocks and a tree. But in later examples such as this, the wilderness is often shown as a forested area, because painters of that time, having never seen a dry desert, visualized John’s wild and deserted habitat as a forest. Now the reason I have written “angel/messenger” to translate the word highlighted and italicized in Greek is to point out that it — angelos — has a double meaning: it means both messenger and angel. The word “angel” originally meant a messenger — but it can also mean just an ordinary messenger. 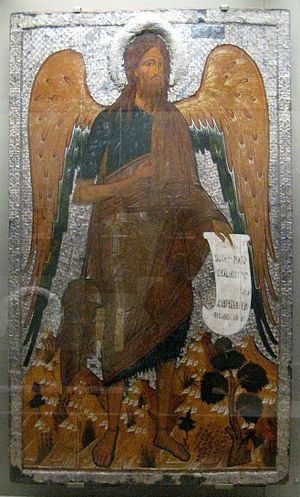 So when reading Mark 1:2-3, Eastern Orthodox iconography chose to emphasize the “angel” meaning of the word — a divine messenger, i.e. an angel, therefore John was given wings. That is the odd logic of icon painting. But before I explain further, we need one more piece of the puzzle. For that we need to consider John’s scroll. In Russian icons, saints and other figures do not speak in cartoon bubbles. They speak in scrolls. So the scroll a saint holds is a kind of cartoon bubble that speaks to the viewer. Ужé бо и сѣки́ра при­­ кóрени дрéва лежи́тъ: вся́ко ýбо дрéво, не творя́щее плодá добрá, посѣкáет­ся и во óгнь вметáет­ся. Sometimes one finds both the “I saw and witnessed” inscription and the “Repent, for the Kingdom Of Heaven” inscription on the same scroll. If you look closely at the “diskos” held by John in the second image, you will see lines curving upward and inward from it, meeting in a little star at the top. This represents the liturgical implement called the asteriskos, the “star-cover.” Its purpose is to support the cloth veil that is placed over the diskos during the Eucharistic ritual in Eastern Orthodoxy. If you recall that the Child Christ as “Lamb of God” lies on the diskos, then you will see why this metal “star-cover” represents the Star of Bethlehem. So that is the knowledge essential to understanding basic icons of John. There are more complex icons, but no need to deal with those right now. It is important to remember, as I have said, that icons have their own logic, and it is a logic of association of images. It can be very complex, drawing from a great many different sources, but all one really needs to know is how this mixture presents itself in icons. Those who have studied Jungian thought will quickly notice parallels with dream images and the concept of archetypes. At middle left is an angel leading the child John into the wilderness; at lower left is the birth of John the Forerunner; at lower right is the beheading of John, and at upper right is the discovery of his head. This particular example is rather unusual in that the image of God the Father (“Lord Sabaoth) shown in the clouds at the top depicts him turned sideways instead of full-face, as is customary. Another unusual feature is that instead of bearing the Christ Child in a vessel (symbolizing the “Lamb” in the Eucharistic bread), John here carries his own head. The head in the container instead of Jesus as “Lamb” was and is the preferred form in Greek iconography, and it was also the standard form in Russian iconography until the 17th century, when the “Child” in the chalice began to replace it. When John’s head is in the container, it tends to emphasize the death of John as a kind of “forerunner” to the death of Jesus, and of course as mentioned, the “Child” in the chalice has Eucharistic significance. A third unusual feature in this image is that the painter has placed the cross of martyrdom in John’s right hand, something generally omitted in this type. By the way, notice in the example below that all of the icon surface except for the central painting is covered with ornate metal. Such adornment was common on very old icons, and yes, the metal was attached by nailing it right onto the surface. That is why old icons, when these covers are removed, are seen to be full of little nail holes. The metal covering was added as a sign of respect, though punching numerous holes in the surface of a painting may not seem so to us today.